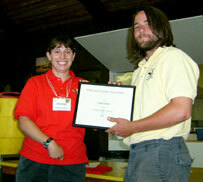 2005 marked eight years of the Alumni awarding bursaries to current HSR staff members. Since 1998, twelve individuals have received bursary awards, with the award amount increasing from $250 to $700. Given the type of person who chooses to work at HSR, and the caliber of those actually hired, all past applicants have been worthy of the bursary award. However, 2005 was the most difficult selection to date. In the end, the selection committee could not decide on a single candidate to receive the award. $700 was the total award amount, and the selection committee members donated an additional $100, to create two $400 prizes. 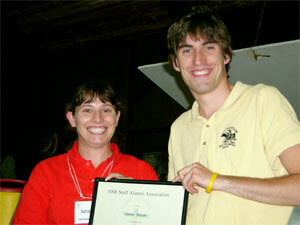 In alphabetical order, since no other ranking could be made, the 2005 Bursary recipients are James Bryan and Erik Lund. James Bryan initially went to HSR as a camper in 1998 with his Scout troop, and returned until he applied for staff. He has been on staff since 2001 working as an SIT, Kitchen Assistant, Maintenance, Kitchen staff, and Rifle instructor. Since 2002, he has worked on the plaques committee. James began studying Environmental Science at the University of Guelph in September. Erik Lund’s experiences with HSR began in 2000 when his Scout troop camped on Pal Point. After his second summer camping, he put his name on the list to be sent an application for staff, and was hired as an SIT in 2002. He returned in 2003 as the Office Clerk. Over the winters, Erik worked towards his NLS (National Lifeguard Service) certification, and was hired to Waterfront Instructor in 2004, and Senior Waterfront Instructor in 2005. With James, Erik worked on the plaques committee. Erik is in his first year at Georgian College studying Police Foundations, with aspirations of becoming an OPP officer. Bursary recipients are required to submit documentation showing registration in a post-secondary institution to receive their monetary award. Both James and Erik included a letter with their documentation, thanking the Alumni Association and stating just how helpful the funds were to help with their educational costs. This entry was posted in Bursary and tagged bursary. Bookmark the permalink.